The DLO is abuzz with wedding plans. When Oliver enters, he overhears Shane talking to Rita about their “girls’ night” plans. Shane quickly realizes that, the usually very organized, Oliver has completely forgotten about planning a bachelor party for Norman. Shane questions this oversight to which Oliver admits that the wedding has made him a bit contemplative, causing him to be distracted. When Shane realizes that Norman has taken all the unclaimed items for the month out for auction she quickly runs from the office to find a box that she’d hoped to purchase before it went to auction. She finds the box and heads back to the DLO only to run into Oliver and have him question her intentions. She admits that she wishes to buy it outright and Oliver responds by bumbling his words and telling her that he can’t bend the rules for her just because they are –especially because they are– together. Shane teases him by whispering in his ear that she loves when he gets all “Ms. McInerney” on her and proceeds to walk off with the box in hand. Shane takes the package back to the DLO and tries on the wedding dress that is contained within. When Oliver enters he finds Shane looking in the mirror and quietly approaches to assist her with buttoning up the dress. Surprised and seemingly uneasy, she tells him that she has no expectations of needing a wedding dress, but that the fabric was so beautiful that she thought she may have it altered into a cocktail dress. While wearing the dress, Shane discovers a hidden pocket that contains a letter from a mother to her daughter. The letter explains that she wishes to pass this heirloom down to her daughter for her wedding day. The mother goes on to say that she’s sorry that she’s missed so much of her daughter’s life, but that it was all to protect her. Shane instantly makes it her mission to find the rightful owner of the dress. After finding out that their florist is unavailable days before their wedding, Norman and Rita visit Norman’s cousin, a florist, for help. Rita tells her that her mother recently died in a spelunking accident. She vulnerably recalls the beautiful and fearless nature of her mother, while obviously mourning her loss at such an important time in her life. When they return to the DLO, Rita finds the initials E.R. sewn into the wedding dress. She recognizes it to be the signature of a local famous dress designer. Evelyn Rose is a ninety-six-year-old designer that has been making dresses for brides for decades. 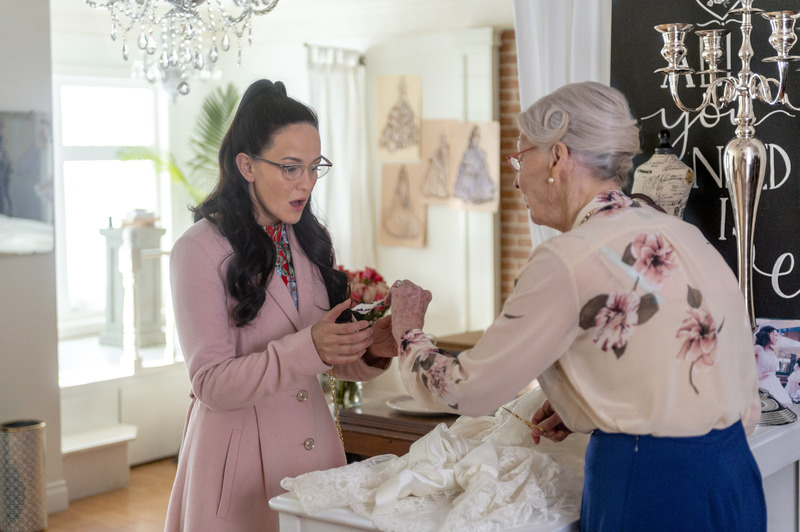 Rita meets with Evelyn and learns that she sews a secret prayer for each bride into every dress. The designer removes the prayer from the dress to reveal the name Jane. After thanking Evelyn for her help, she reveals to her that she’s always dreamed of wearing an “Evelyn Rose” designed wedding dress. Evelyn asks her about her current dress plans and Rita explains that she’s borrowing a dress from a friend that is long and covered in bows, to which Evelyn offers to make her a dress for her special day. Continuing the hunt for the owner of the unclaimed wedding dress, Shane and Oliver follow a clue from the letter stating that the mother and daughter always enjoyed an 1892 Darjeeling private blend tea on Sunday’s; that leads them to the Brown Palace hotel. Oliver and Shane meet Mr. Frye, who has served the patrons of the Brown Palace for over 37 years. After bonding with Oliver over being mutual “connoisseurs of the leaf,” he assists them in finding the reservation books that have been archived in the kitchen. When Norman finds a drawer full of returned wedding invitations he sadly realizes that his grandmother will not be attending his wedding. Rita excitedly enters to tell him about the Evelyn Rose wedding dress development, but then she notices the letters in his hands and apologizes for not telling him sooner. He tells her that although he is sad, nothing will ruin the happiest week of his life because he gets to marry her. As he finishes that sentence, the phone rings. It is the minister calling to tell them that he will be unable to perform the ceremony because he has come down with the measles. The couple brainstorms a back-up plan to which Rita, to the obvious dismay of Norman, gleefully suggests Ramon. Oliver remains distracted by the thoughts of weddings and the future. Shane asks him to forget that he saw her in the wedding dress and reminds him that there is no reason to be awkward. With that, she excuses herself and uses her postal credentials to gain access to the forwarding address that Ardis Pennington Payne, Norman’s grandmother, left with the Brown Palace during her last visit. At the DLO, Norman notes that all the stamps on the box that held the wedding dress are pictures of strong and brave women. He concludes that the sender must have something in common with them and is possibly staying in hiding for her own safety. Oliver is way out of his element attempting to plan a bachelor party, so Shane convinces Joe to come over and help. Oliver has difficulty wrapping his mind around why people would sit around eating junk food, drinking beer and smoking cigars. He worries that his freshly cleaned carpet will be soiled by wing sauce and cannot fathom the idea of a large crowd in his living room. While preparing for the party, Joe shares the O’Toole family’s ugly green tie story. Legend goes that their great-great-something grandfather was in love with a woman, but didn’t act fast enough. When he noticed another suitor going to propose to the woman he loved, he borrowed a tie from the local blacksmith and ran to his love’s house to propose. She accepted and an O’Toole man never wore an ugly green tie again, unless he was proposing. Joe admits that he wore an ugly green tie when proposing to Oliver’s mother and Oliver admits that he didn’t propose to Holly; she proposed to him and then they eloped at the courthouse. 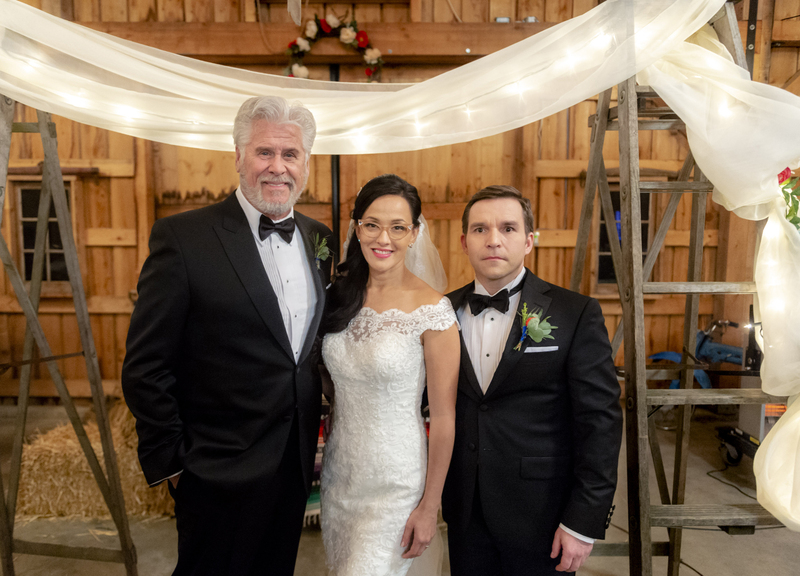 The POstables visit Rita’s father, Bill, at his farm. 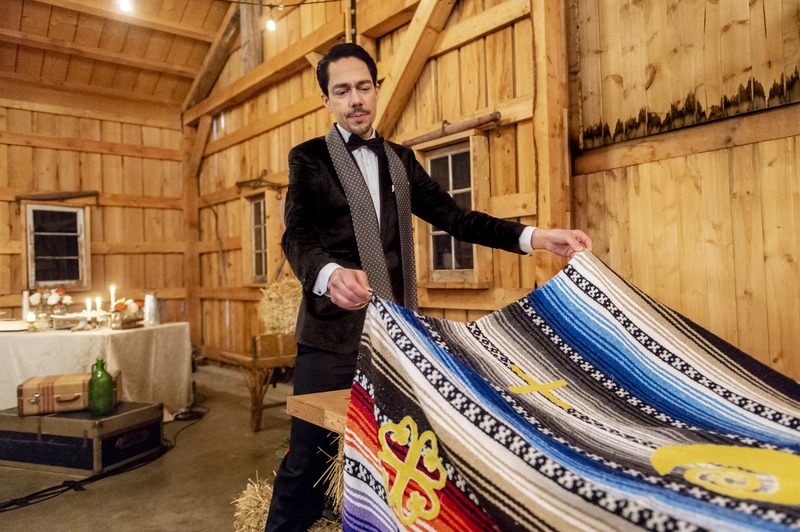 While walking to the barn, Norman asks Oliver how he feels about Ramon performing their ceremony, to which Oliver mumbles on about ridiculous archaic wedding traditions. He goes as far as to equate throwing the bouquet to a “barbaric exercise in female wrestling.” Norman gently reminds Oliver that he understands what a stressful time it is given that HE is the one getting married in a couple of days. Bill gives Norman and Rita a handmade canoe as their wedding present and reminisces with Rita about his own wedding day with her mother. He tells her that her mom altered her own wedding dress and that she took it in so many times that it ended up being no bigger than a postage stamp. Discussing alterations puts Shane in mind of the fact that Evelyn said that she put a prayer in every dress for every bride. They all rush back to the DLO to see if there is another name in the dress because the letter mentioned that the dress was altered when it was passed down to the mother from the grandmother. Shane searches the dress and finds a second prayer, this time noted for a bride named Annaliese. With this lead they return to the Brown Palace Hotel to see if Mr. Frye recognizes the name. After explaining more about the stamps and the brave women on them, Mr. Frye recalls a woman that came in on Sundays with her daughter. The mother would tell the daughter stories about a heroic woman named Annaliese. The character was a mysterious woman of fortune who always risked her own life to keep her family safe. The mother would tell the stories and the daughter would write them down. Mr. Frye’s description triggers Rita to remember a sign that she saw the previous day for an author named Jessica who wrote a series of books called, “the Secret Adventures of Annaliese.” Mr. Frye confirms that the daughter’s name was Jessica. They meet with author Jessica Gordon at a book signing. They bring her the dress and she tells them of her mother. Her mother worked many jobs to raise her on her own after her father left. They always had tea on Sundays and she’d write the exciting stories her mom would tell her. Her mom told her that she worked undercover for a government agency that worked to keep the world safe. She would take off on a mission and then return with another exciting story of bravery and adventure. When she was twelve her mother left on a mission and never returned. When she turned twenty-one she concluded that her mother had just dumped her and that the stories weren’t real. Norman quickly comes to the defense of her mother and says that there is no way that she just ran away. He points out that the stamps that she chose were all thoughtfully handpicked and proved that she is a strong and brave woman. Jessica admits that there had been other letters over the last 5 years and that they all arrived on the same stationery with the same stamps on them. 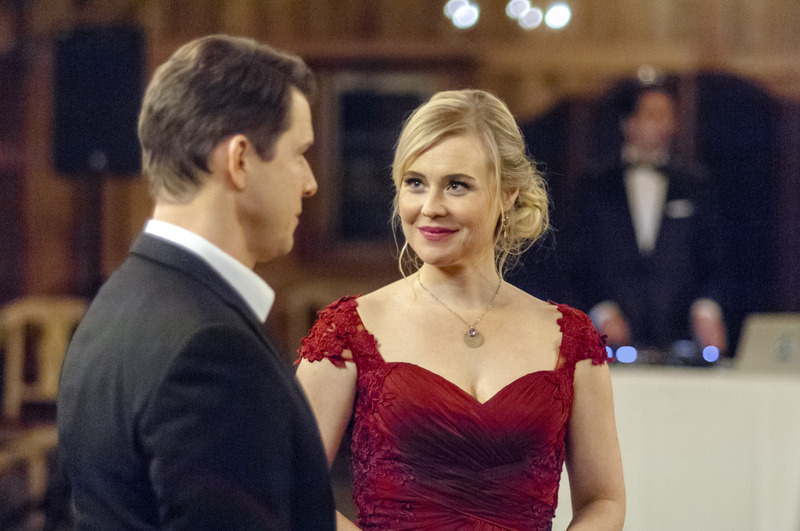 She tells the POstables that she’s learned to work through her anger and fears of abandonment by writing her mother’s stories and sharing them with the world and that the only other person who know that the stories are from her mother is her husband. Caught up in the moment and feeling guilty that the dress didn’t arrive in time for Jessica’s wedding, Shane offers to help find her mother. At the DLO, Oliver confronts Shane about her offer to find Jessica’s mother. He believes they have no jurisdiction or leads to locate Annaliese, to which Shane assures him that she has a theory. Shane believes that Annaliese has returned to the Denver area because there is no other way she would know the details that she wrote in the letter. She also stated in the letter that she would “be there” at her daughter’s wedding instead of saying that she would be there in spirit. Oliver becomes a bit short with Shane and then admits that he has a lot on his mind. Shane sweetly calms his nerves and tells him to not stay in his head for too long. She encourages him to focus on the bachelor party and that she will take care of the investigation for Annaliese. At the spa, Rita tells Shane about her experience with couple’s counseling with Ramon. Taking his job very seriously, he tells Norman and Rita that they need to make sure to include God on the guest list because “when you invite God to the wedding, he stays for the marriage and a cord of three strands can never be broken.” After girl talk and a pedicure, Shane informs Rita that they have to crash the boys’ bachelor party so they can be part of a surprise for Norman. When Norman and Oliver enter Oliver’s house all of Norman’s cousins and friends jump out and surprise him. Joe and Bill roll out a giant cake while Ramon DJs. As the music plays, feathers pop out of the top of the cake and then a screen featuring Norman’s grandmother, Ardis (Carol Burnett), appears! Norman is so happy to see his grandmother, even if it is only digitally. He walks her around the party and introduces her to all his cousins and friends. When handed to Bill they quickly realize that Ardis knew his wife, Sonny, when they both lived in New Guinea and learned to weave. He tells her that his wife had started a blanket on the loom as a wedding gift for Rita before she died. Ardis convinces him to let her help him finish the blanket in time for the wedding. At the party, Oliver remains stressed and nervous. Joe notices that Oliver hasn’t looked Shane in the eye all night and tells him that it’s obvious that he’s preoccupied. Oliver asks his father if he’s “ever thought about somebody one way for a long time and then one day they say something, or do something and you can’t get it out of your head?” Joe tells him that he needs to realize and come to terms with the fact that he and Shane are very different people and that that fact isn’t going to change so he needs to figure out what he wants. Joe and Oliver are interrupted when Ardis announces that she’s donating to the O’Toole foundation as a wedding gift to Norman and Rita. 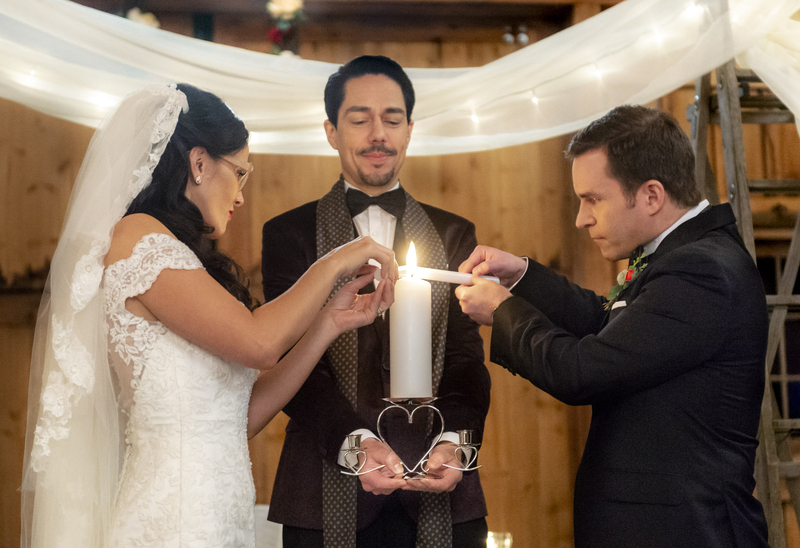 When Shane retrieves a piece of paper to write down Ardis’s accountant’s information, the POstables realize that it’s the same type of paper that the letter that accompanied the wedding dress was written on. The stationery came from the Brown Palace Hotel. Shane and Rita return to the Brown Palace Hotel to attempt to acquire information on Annaliese. Much to their surprise, they discover that Annaliese works there as a housekeeper. She tells them that she started hallucinating when Jessica was eight years old. She’d lose track of time and feel hopeless, and then the next day, feel on top of the world. She originally created the stories for her daughter, but then began to believe they were true. She tells them how she was in and out of clinics for years and that she ended up admitting herself to a life in mental health program to protect Jessica from herself. She lived there for years until the clinic closed and she ended up homeless. At that time, she would convince herself that she was an undercover reporter. One day, on a good day, she saw a little girl reading a book on a bench and realized that the book was written by Jessica and that it was one of the stories that she had told her when she was a child. She realized at that moment that her daughter was doing well and that she hadn’t forgotten about her. That inspired her to check herself into the hospital and they found a medication that worked for her. She started over in a therapeutic community and had worked at the hotel for five years. She began writing the letters to Jessica in hopes that she would believe in her again. When she found out her daughter was getting married she sent the wedding dress. She tells them how she watched Jessica’s wedding from the kitchen, hoping that she would see her in the dress and that when she didn’t wear it she assumed it meant that she didn’t want to wear it. Shane and Rita tell Annaliese that her daughter misses her and that she should tell her these things in person. Annaliese explains that she’d rather have Jessica believe in what she’s pretended to be than to see her in person and be a disappointment. She wants to be remembered as a someone who is strong and brave, someone that mattered. Rita assures her that she is strong and brave, that she’s “faced a horrible darkness and had the courage to ask for help.” Shane reminds her that she’s helped thousands of children by inspiring them to take the higher ground because they read Jessica’s books and were inspired by her. They convince her that it’s time to come home and be with her daughter. Rita and Shane tell Jessica about her mother’s struggles. Jessica becomes upset and bitter because she can’t understand why her mother wouldn’t have contacted her if she could. She tells them that maybe it’s just too late for them to have a relationship. Rita quickly cuts in and heartbreakingly reminds her that it is not too late because she knows what too late feels like. She tells her about her own mother’s death this year and that she wishes more than anything that her mother could be there for her wedding. She tells her that although her mother didn’t face the same challenges that Jessica’s mother did, she made choices that Rita didn’t understand and will never get the opportunity to talk to her about it or to just thank her for everything that she did for her. Rita begins to cry and continues to explain that if she “could do just one of those things today [she] wouldn’t waste a second thinking about the time that [they] lost.” Rita reminds Jessica that her mother loves her more than anything in the world just because she’s her mother. Rita’s deep words of love and understanding lead Jessica to want to meet with her mother. The POstables accompany Annaliese to meet with Jessica for tea at the Brown Palace Hotel. When they enter the dining room Jessica is there, wearing her mother’s wedding dress. Annaliese is overcome with gratitude. She thanks the POstables and reunites with her daughter. Annaliese apologizes for the years of distance and Jessica assures her that it’s okay. Filled with pride over a job well done, the POstables head to the lobby of the hotel together. As Norman takes a phone call, Shane and Oliver continue walking through the lobby. Oliver declares that they make a good team, to which Shane agrees and says, “I love us!” Oliver stops and looks her in the eyes and says, “and I love….you.” Surprised for a moment they stare in each other’s eyes until Shane finally says, “oh you do, huh?” He admits that he’s still contemplating what to do with those feelings and she assures him by saying, “does it help if I mention that I love you so……” “SKUNKS,” Norman interrupts. He tells them that the church called to tell them that they were no longer available for the wedding the next day because of skunks that got loose in the sanctuary and created a terrible odor. The wedding is moved to Bill’s farm. It all comes together beautifully. The decorations, the music, the cows– it is all perfect. Gabe (Keb’ Mo) makes a return to play for the ceremony. As guests enter, Oliver and Norman share a sweet moment and Joe brings Oliver his jacket and tells him to check the pockets, just in case. Bill walks in to find Rita in her wedding gown; it is gorgeous and no bigger than a postage stamp. He tells her that she reminds him of her mother on their wedding day and that her mother’s last gift to her would be at the altar. Shane comes in and hugs Rita, who is more like a sister now than a friend. She tells her how much she loves her and they prepare to walk down the aisle. As Shane makes her way to Norman and Oliver at the altar she realizes that Oliver is wearing an ugly green tie and begins to tear up. Ramon pronounces Norman and Rita husband and wife. 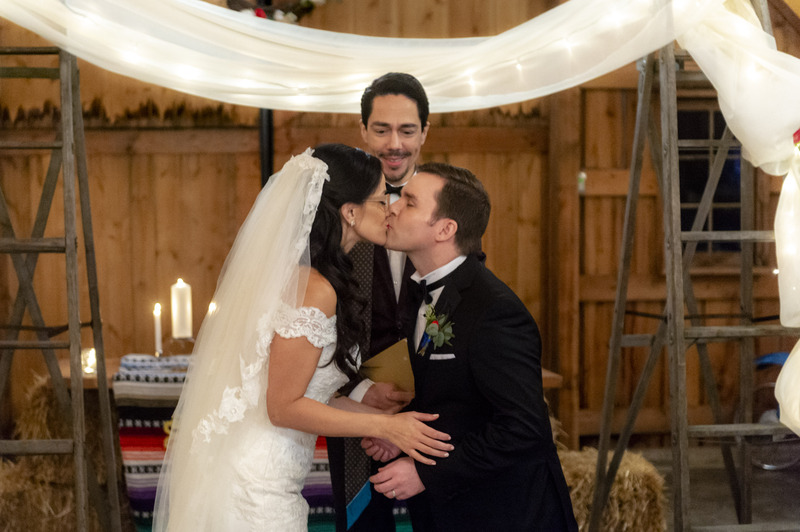 As they prepare to walk down the aisle, Norman realizes that there is an owl, Rita’s favorite animal in the world, in the barn that witnessed the entire wedding. As Shane and Oliver make their way back down the aisle, Shane asks Oliver if he’s “wearing what [she] thinks he’s wearing” to which he grins an adorable boyish grin. Oliver escorts Shane outside, takes her hand and says, “Don’t look at my tie, look at my eyes and listen to my heart.” Down on one knee, he continues, “Marry me and I will love you forever and I promise I’ll never wear this tie again.” Shane laughs and says, “It’s pretty awful. YES, Oliver, yes! I will marry you and love you forever!” He gives her his grandmother’s ring and tells her she was the finest woman he ever knew until he met her. She grabs him by the tie, pulls him close and kisses him sweetly. Signed, Sealed, Delivered: To the Altar is absolute perfection. Martha Williamson handles every emotional and painful topic she covers with beauty and grace. A deep respect and care is shown when she takes these hurdles that so many go through in life and makes them approachable and conversational. Crystal Lowe does an incredible job bringing the character of Rita to life. Lowe has spent the last five years cultivating a character from shy and sweet to brave and strong and beautiful. Kristin Booth has the innate ability to light up any scene as Shane. She makes the viewer laugh and cry like no other. I can’t imagine anyone else in the world playing Norman than Geoff Gustafson. His gentle and innocent sweetness makes Norman the most likable character on television. 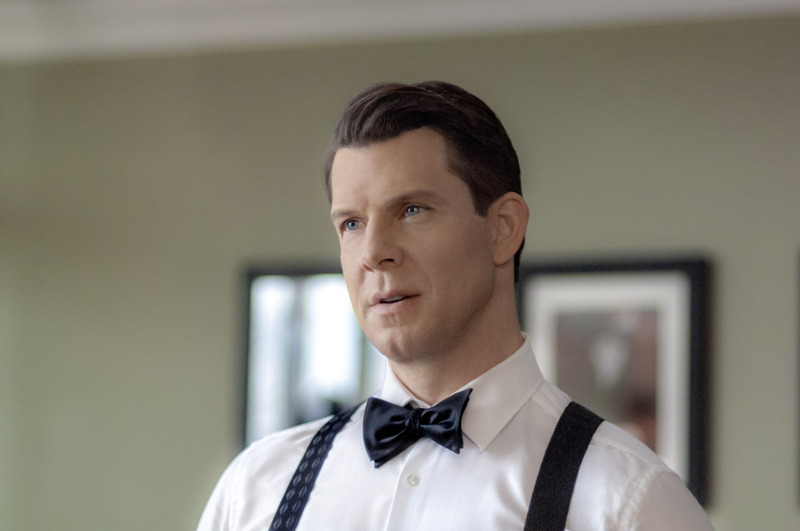 Eric Mabius speaks volumes without saying a word. His ability to captivate the audience with a slight tilt of his head or a sweet sigh is remarkable. 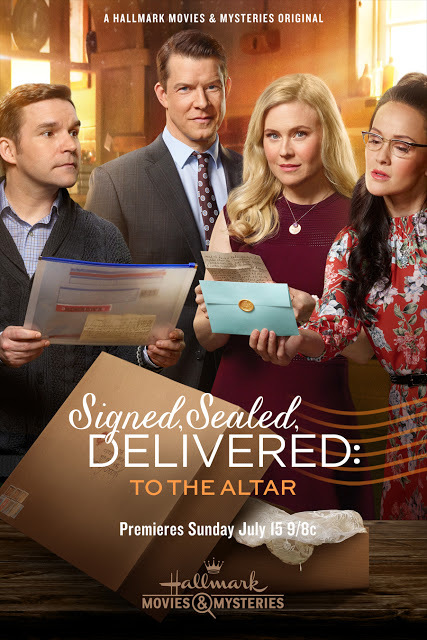 The Signed, Sealed, Delivered series is a powerful force for all that is good and kind in this world. They are the few, the proud, the Postal! It was a wonderful she. Every character is perfectly portrayed. Hope the series continues. Love this series, DVR’d so we can watch it again. Sure hope the series continues! Signed Sealed Delivered is my absolute favorite show on television. I pray it continues. The stories are inspiring, uplifting & faith in action. I love love love this show. God Bless Martha Williamson and these wonderful actors that give these characters life. Who played Annalise? It was not listed in the credits. What a great and comprehensive review. This is an amazing series and really hoping the Crown Executives continue producing more.